With the transmission in neutral, support the motorcycle using a jack and turn the rear wheel slowly by hand. Visually check the drive chain for the possible defects listed as follows. If any defects are found, the drive chain must be replaced. Refer to “drive chain replacement” in section 3a . when replacing the drive chain, replace the drive chain and sprockets as a set. Loosen the axle nut (1). 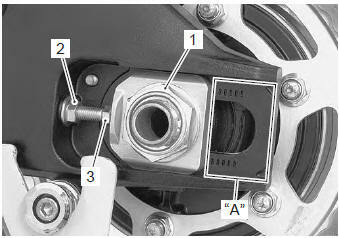 Loosen the left and right chain adjuster lock-nuts (2). Give tension to the drive chain fully by turning both chain adjuster bolts (3). Count out 21 pins (20 pitches) on the chain and measure the distance between the two points. If the distance exceeds the service limit, the chain must be replaced. After finishing the drive chain length inspection, adjust the drive chain slack. Support the motorcycle with a jack. 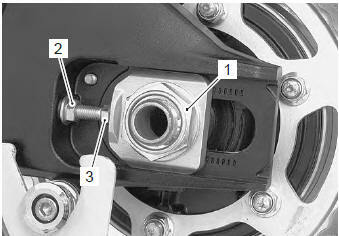 Loosen or tighten both chain adjuster bolts (3) until there is 20 – 30 mm (0.8 – 1.2 In) of slack “a” at the middle of the chain between the engine and rear sprockets as shown in the figure. the reference marks “a” on both sides of the swingarm and the edge of each chain adjuster must be aligned to ensure that the front and rear wheels are correctly aligned. After adjusting the drive chain, tighten the axle nut (1) to the specified torque. Tighten both chain adjuster lock-nuts (2) securely. Recheck the drive chain slack after tightening the axle nut.